Catching up with The Chieftains’ Paddy Moloney recently, our topic of conversation turned to the current state of traditional music in Ireland and, more particularly, to the resurgence of the uilleann pipes. While noting the growing numbers of young adepts, Paddy pinpointed Dubliner Ronan Browne as one of the prime exponents of the instrument and now comes the chance to hear the current state of Ronan’s art. Some may know Ronan via his work on pipes, flute and whistles with Cran or his recent solo album The Wynd You Know while others may be familiar with an album he released in 1988, The South West Wind, which focussed upon traditional music from County Clare. His partner on that occasion was the fiddle- and flute-player Peter (sometimes Peadar) O’Loughlin, a force in the county’s music since the late 1940s and a fine piper in his own right. Apart from playing with both the Tulla and Kilfenora Céilí Bands., Peter was one of the quartet (alongside P.J. Hayes, Paddy Canny and Bridie Lafferty) who recorded the quintessential All Ireland Champions – Violin in 1959, one of the first albums of Irish traditional music. 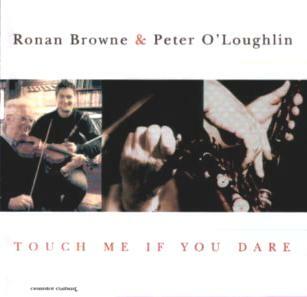 While The South West Wind was itself remarkable for Browne and O’Loughlin’s seamless musicianship, Touch Me If You Dare is awesome confirmation of this pair’s prowess. Unaccompanied throughout almost all of 23 tracks, constituting almost 75 minutes of music (unequivocally good value for money), the duo whirl through a selection that has more highlights than even David Beckham’s latest hair-cut. There are reels and jigs a-plenty and the virtual absence of hornpipes is a fair reflection of their status in Clare’s music. In every case Browne and O’Loughlin play to the tunes’ strengths, emphasizing both the power of the melody and the structure’s innate rhythm. The East Galway fiddler Maeve Donnelly adds further resonance on five tracks while one of Clare’s favourite accompanists, the pianist Geraldine Cotter, graces three in typically understated style. Add exceptionally clean production work from Ciarán Byrne and astute liner notes from piper Pat Mitchell and the net product is one of the most gripping, soul-enthusing releases to have appeared in Ireland during the last decade. For more information about Claddagh Records visit–www.claddaghrecords.com.